Two brothers charged in connection with an alleged airliner bomb plot have walked free from court. The judge at the City of Westminster Magistrates' Court in London ruled there was insufficient evidence to put them on trial. Mehran Hussain, 24, and Umair Hussain, 25, of Chingford, east London, were discharged after a committal hearing. They were accused of failing to disclose information about a brother, Nabeel, who was a suspect in the case. District Judge Quentin Purdy said there was not enough evidence to try the brothers. The pair, who had been arrested at their home on 9 August, had been charged in connection with an alleged plot to bomb trans-Atlantic airliners in mid-air. 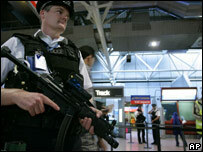 The alleged plot sparked a massive security clampdown, which led to widespread disruption at British airports in August.